I have three Buff Orpingtons that to me are almost identical. So identical that rather than give them individual names, I chose to give them a group name, which is The Mandrell Sisters. 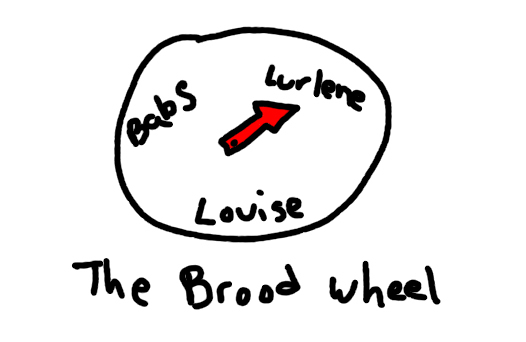 I suppose I could have given them individual names within that name, such as Barbara, Louise, and Lurlene, just like the actual Mandrell Sisters, but aside from not being able to know which one was which, there’s also the issue of which one was going to be Lurlene. 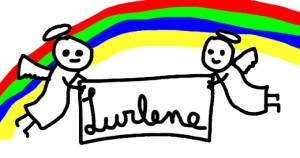 Lurlene is not a name given lightly. At least not by me to a chicken. It’s a magical moment when this name is assigned. I pay pretty close attention, but I’ve never been able to get a handle on them visually or personality-wise. They’re all roughly the same size, and pretty much the exact same temperament. My take on Buff Orpingtons is that they are pretty mellow, all around nice chickens. My Barred Rocks have more variation in personality, from the vaguely malicious boss type, to the afraid of everything type. The Orpingtons are sort of the everyman of chickens. This is fine. They’re the bedrock of our flock. I really just wish I could tell them apart. Partly because I feel like I’m slighting them, but also because they keep going broody on me, and I’m curious to know if it’s the same one, or some sort of rotation. How else do you know whose turn it is? There have been times when I could tell at least one of them apart from the others. When they were still living in the brooder, one of them had managed to get some, er, “fertilizer” on her back. She didn’t seem too concerned about cleaning it off, and didn’t like it when I tried to. I figured if she was o.k. with it, then it was probably better to leave it than to stress her out by trying to rub it off. While it lasted on there, I referred to her as a form of “Poopy Mandrell,” that I can’t say on the radio. So let’s just pretend I called her Poopy Mandrell. The poop didn’t take too long to come off on its own, and so she disappeared back into the crowd of three. You have to be subtle when pointing this out. Shortly after moving them out to the coop, I stuck my head in to say goodnight, and saw one Mandrell Sister pecking at another one’s back. This had apparently been going on for a while, as there was blood all over the place. I reached in and broke it up, and then went inside to figure out what to do. I looked up anything to do with pecking, and it’s kind of hard to know why this happened, but the gist of the fix seemed to be to put something called Blu-Kote on it. It would dye the feathers blue, but if the chickens kept pecking, they’d get a taste of Blu-Kote, and that would be the end of it. We didn’t have any on hand, so I grabbed some trusty Bag Balm, and put it on the wound to at least keep it from getting infected until I had the chance to get to the feed store. 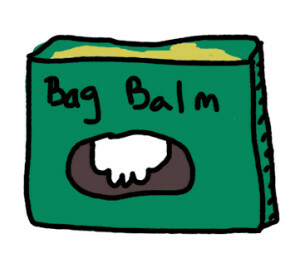 When I did get to the feed store, they told me Bag Balm would work fine too, so I lucked out. For about a month or two afterwards, the one who had been pecked had a stain on her feathers from where the Bag Balm was, so she stood out. It too eventually went away, and she eased back into anonymity. 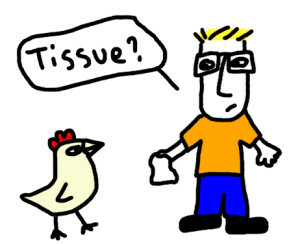 I still don’t know why she got pecked, though. Incidentally, I didn’t kill the chicken who did the pecking, and it hasn’t happened again. I’m sure someone told me to kill the culprit, but as has been my experience, I found it was a one time thing, and lives were saved. The Bag Balm stain got me to thinking about other ways to mark them. The obvious indelible option would be to write their names on their back in magic marker. It would be pretty funny to see a chicken with “Lurlene” written on her back in giant letters. It would even be funny to see one with “Poopy” written down her back, at least to me. 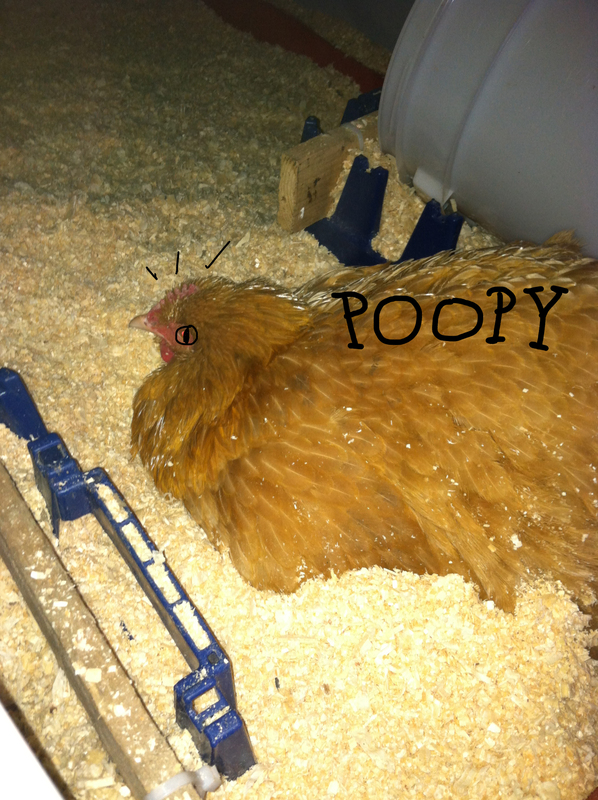 However, getting a chicken to hold still long enough to write legibly on her is not a task I want to attempt. Plus, the joke might wear off after a while. It’s kind of like a regrettable tattoo. It seemed like a good idea at the time, but now I have a dumb-looking chicken. So I don’t think I’ll try this. Not how you do it. You can actually buy a device that will put a colored band on their legs for identification. The problem here is that they aren’t cheap, and I only have three chickens I want to distinguish. That seems like a big investment for something that’s not all that big a deal. I would like to know if it’s the same one getting broody, and I’d feel a lot better about myself if I could tell them apart, but I don’t feel so bad that I’m going to blow a lot of money on it. I can probably just get some zip ties or something if it finally wears me down. 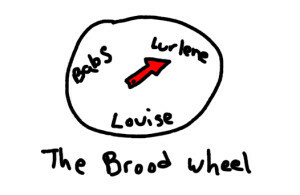 But I’m only going to do that once I know in my heart of hearts that I’ve got a Lurlene in there. This entry was posted on Friday, June 21st, 2013 at 4:00 pm	and is filed under Backyard chickens, Chicken Identification, Chickens, Eggs. You can follow any responses to this entry through the RSS 2.0 feed. You can leave a response, or trackback from your own site.